It’s been ages since I wrote a post and I’d love to say that I’ll do a better job in the future, but it’s impossible to predict how busy life can be, especially with the holidays coming up. So what have I been up to these past few weeks? Months? I’ve mostly been working on expanding my career opportunities in the teaching field, by studying and taking several exams to work towards my teacher certification. My hard work has paid off since I passed my three exams with perfect or almost perfect scores and I can now get my foot back into the educational field. This is only the first step of a long process, during which there will be more studying and more tests to take, and even larger obstacles to overcome down the road, but I know it will be worth it in the end for my kids and myself. Besides studying, I’ve spent more time on creative activities, including drawing and painting for myself, as well as teaching two art classes at my kids’ school as a volunteer. My goal is to create enough artwork and crafts to make them available for sale online sometime in early 2015. 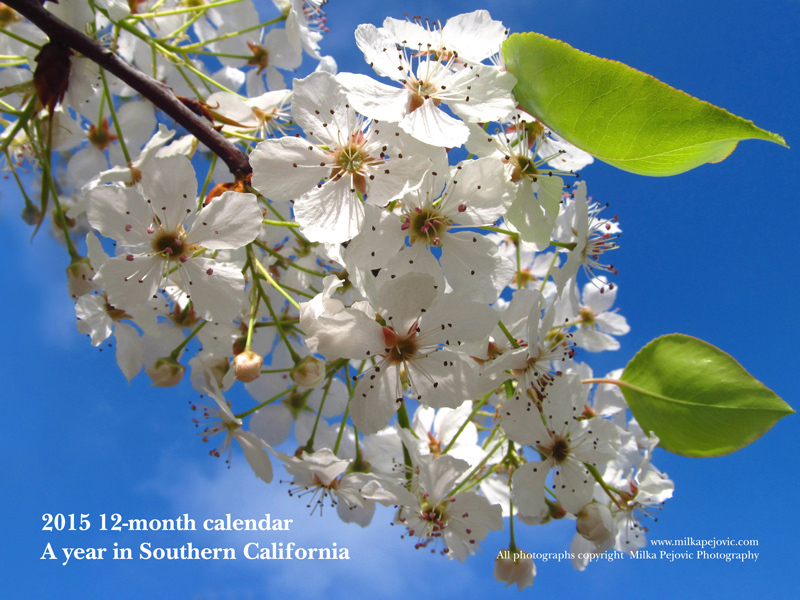 I’ve also recently created five new nature photography calendars for 2015 (the five themes are a year in Southern California, bees and other insects, water lilies, flowers and blooms, and water). The good news is that you can save 65% off on any of my calendars this weekend, so if you’re looking for a unique gift this holiday season, this is a great opportunity. I hope you had a great Thanksgiving with your loved ones. I have a lot to be thankful for this year. Besides taking steps to realign my career goals with my personal aspirations, a lot of good things have happened (and a lot of bad things too, let’s be honest!). I have made new friends and strengthened existing friendships. I have made additional efforts to stay active and healthy. I have continued encouraging my kids to be curious and inquisitive about the world around them. I have challenged their thinking process and their academic abilities. I have taken them on an amazing vacation to the East coast, where they got to see and learn so much about US history with their own eyes. They enjoyed it so much, they can’t wait to go back and discover more. I also found great roommates, who ended up being way more than what I hoped for. It’s funny how life works sometimes. And of course, now that Thanksgiving is over, our favorite time of the year is coming! Today we’ll start decorating our house for Christmas, playing Christmas songs and reading more and more stories with a holiday theme. And I think our elf on the shelf will be back very soon too. All we need to feel more in the mood is for Mother Nature to turn down the thermostat so it’s not 85 degrees during the day anymore. I don’t think that’s much to ask. When I say I have a lot to be thankful for, I’m not kidding. 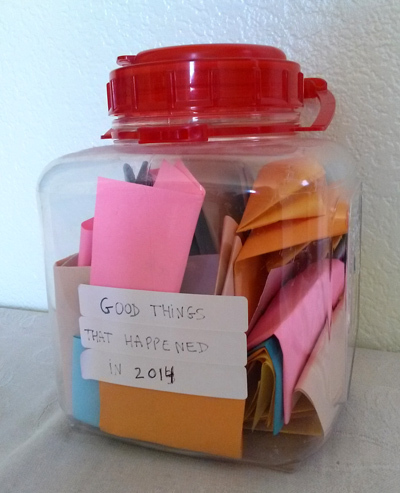 This is our jar of good things as it stands one month before the end of 2014. I can’t wait till my kids and I go through it to remember some of these great moments. What are you feeling thankful for this holiday season? 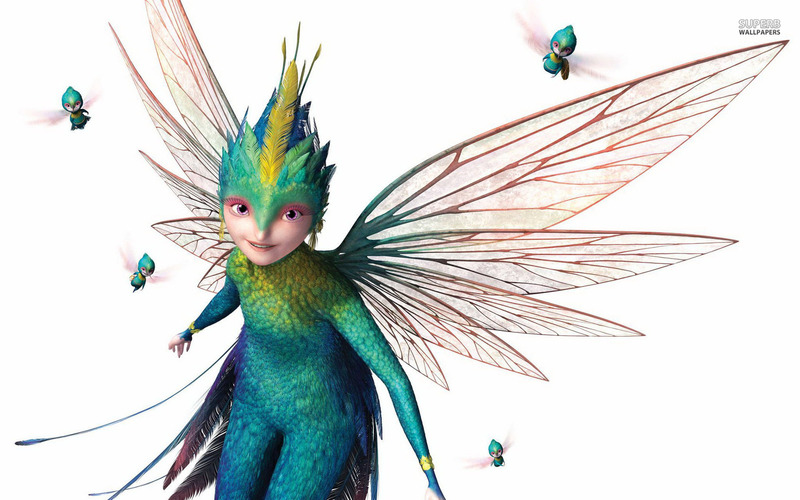 Goofy Monday: Is the tooth fairy for real? It’s been a long time since I posted a Goofy Monday and since I’ve managed to take notes about a few goofy moments over the summer, I thought today would be a good time to share them with you. 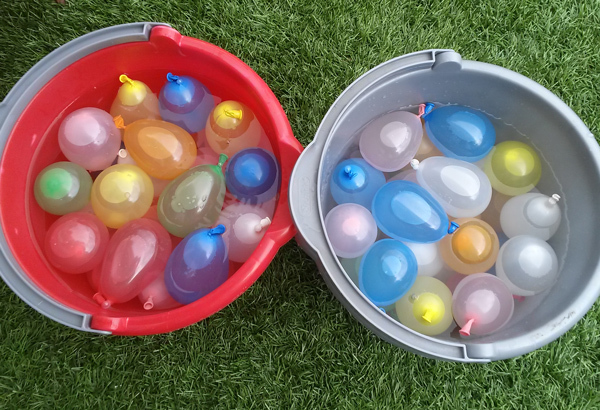 A quick reminder: Son #1 turned 8 over the summer, Son #2 is 6 and 1/2. What happened to my birthday month? I think he could learn a thing or two from his brother. What a great summer school teacher I am! Being a mom really is an ungrateful rewarding job. Is the tooth fairy for real? Son #2 lost a tooth yesterday and it started this conversation. Have your own kids told you something recently that made you laugh? Or cry? Feel free to share in the comments section below. Summer’s over and I’m back! Yesterday was one of those bittersweet moments. I was excited for my boys to start first and third grade, but it also meant that our two months of summer vacation had ended. Sure, my kids can drive me nuts but they’re also a great source of entertainment, fun and never-ending questions. I took a much-needed break from blogging and some other things to concentrate on my kids, as well as doing some soul searching when it comes to my career path opportunities. I’m stuck in more ways than one where I am, so it’s been a challenge trying to figure out what to do with the given circumstances. I drafted a plan and now that the kids are back in school, I hope to have more time to refine the individual steps. Time will tell. Hopefully I can share some progress and good news as I go along. I thought I’d share some of our summer adventures in pictures. 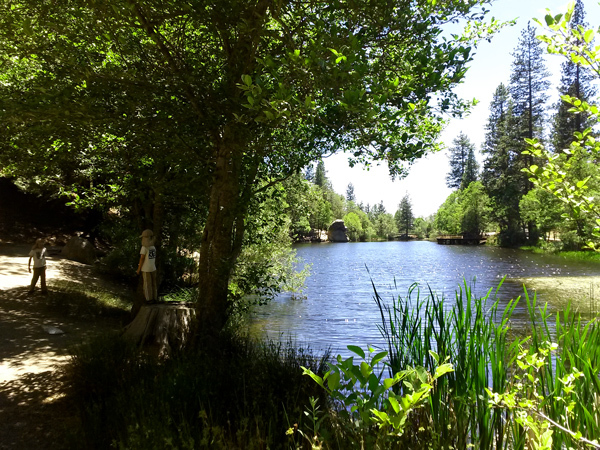 We finished June by celebrating my birthday and taking off for a week’s vacation once again in the Southern California wooded mountains, in the small town of Idyllwild. 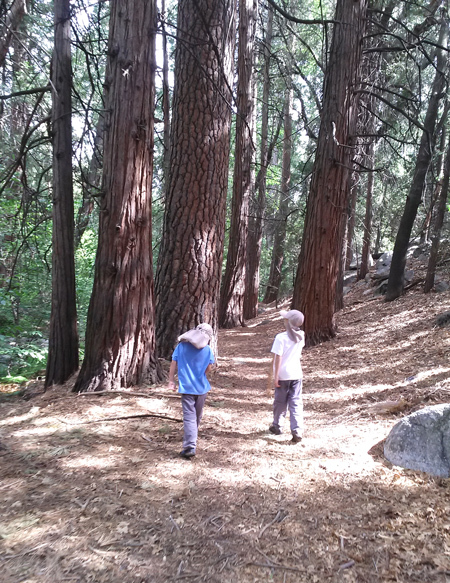 There we smelled the pines as we hiked in the forest. We enjoyed beautiful sceneries and stayed reasonably cool while San Diego experienced a major heat wave while we were gone. We had plenty of picnics in the middle of nature, including by this adorable pond. 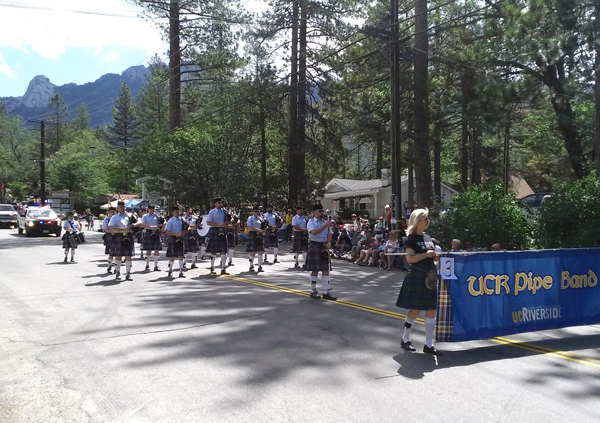 We enjoyed the 4th of July parade, which has an entertaining hodgepodge of participants, including musicians, old cars, rescue dogs, firetrucks, and even a special visit by Santa Claus. The skies turned darker as the parade reached its end, until it… rained!!! We were so happy to feel the raindrops, we went out and danced in them for a while. 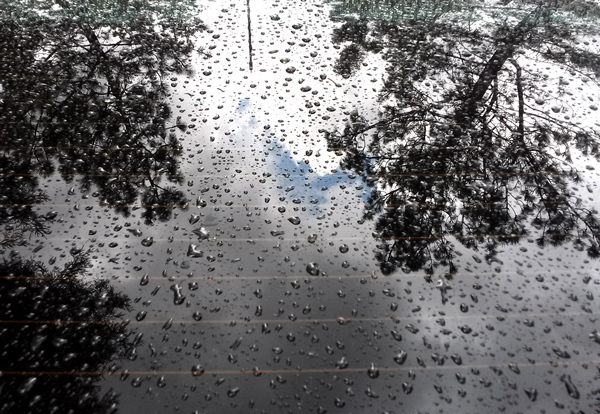 We had more rain and even thunder for the rest of the day and overnight. The smell of wet earth the next day was one of my best memories of this trip. Somehow the rain followed us back to San Diego because within the next week, we had a HUGE thunderstorm over our house. Tons of lightning directly followed by thunder, and rain. A lot of rain in very little time. Flash floods, anyone? It lasted maybe 30 minutes but we opened all the house windows to take it all in. Back home, we enjoyed a lot of free time, and celebrated my oldest’s eighth birthday. The boys also took part in a few more structured activities, like swim lessons, and basketball camp. We celebrated the end of camp with this basketball food art. 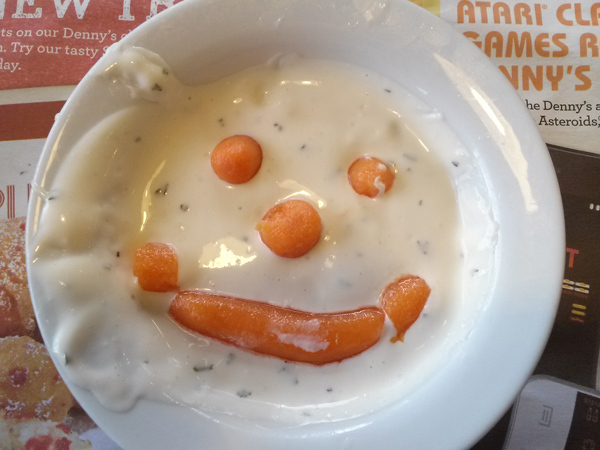 My oldest seems to have inherited my talent for food art. 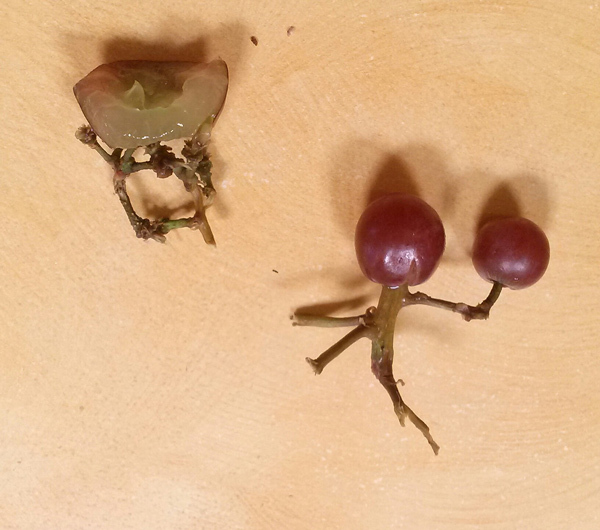 He loves playing with his food as much as I do. Talking about art, the boys had a great time at art camp. This year’s theme was “under the sea”. Lots of bubbly and spooky water creatures came back to our house at the end of camp. 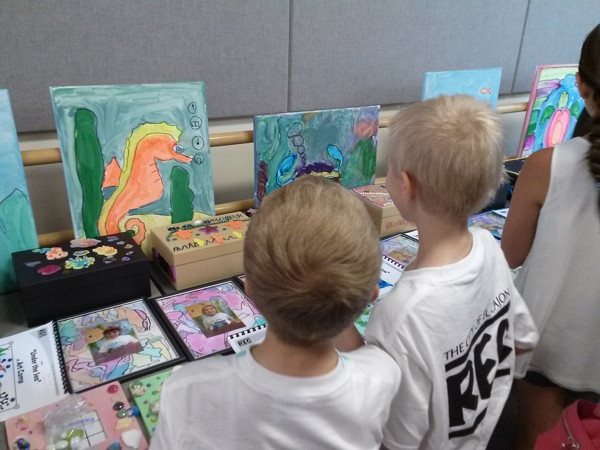 The last day features an art show, where you can see every kid’s creation that week. I had planned to spend some time sharpening my drawing skills this summer. 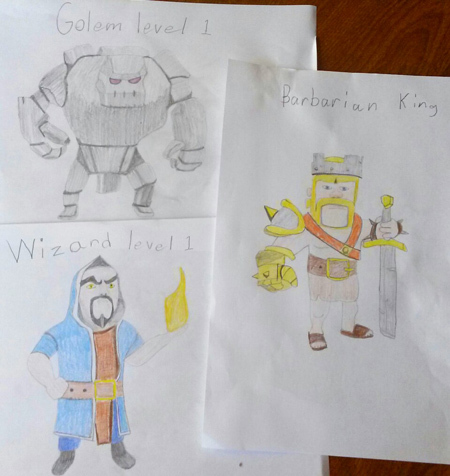 While I forced my kids to do homework, they forced me to draw for them, mostly characters from their favorite video games, including Clash of Clans. Man, that stuff is hard to draw! 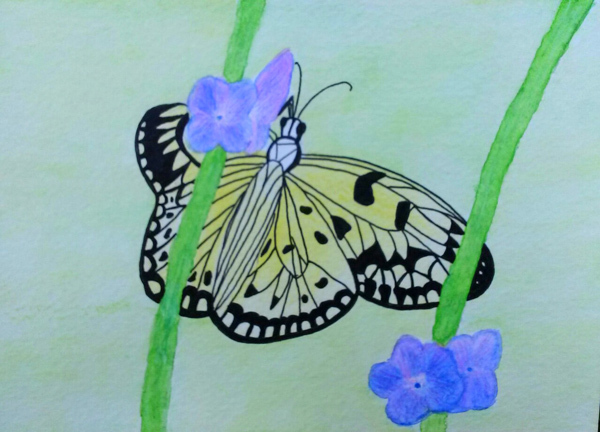 Fortunately I also found a little time, although not as much as I wanted to, to draw other things, like this paper kite butterfly from a photo I had taken a while ago. I wasn’t the only one with the urge to create. 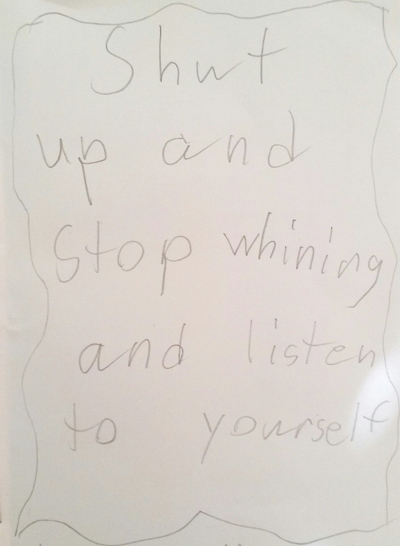 Inspired by a comic strip by Calvin and Hobbes, my eight-year old decided to write his first self-help book. This is the cover. Move over, Dr. Phil, you’ve got some serious competition! His book contains three steps (illustrations included), the first one being “nobody cares so stop whining”. I just wish the kid would follow his own advice sometimes. 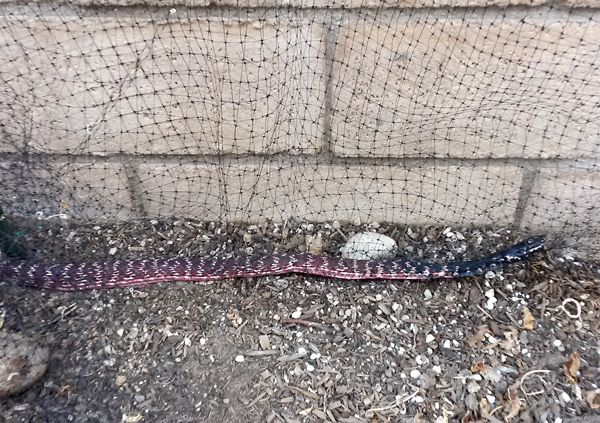 Of course our summer wouldn’t be complete with the yearly visit from our snake, the infamous red coachwhip! Yep, that’s three years in a row… You can read about the snake’s first visit, and the second one. But guess what? Unless this snake laid eggs that hatch babies that want to come back next year, there won’t be a snake visit next year. That’s because this guy/girl managed to wrap itself really badly into the netting and died. So I untangled it and threw it in the bushes over our fence. That night, I heard a lot of rustling in those bushes. I thought, wow, the snake wasn’t dead after all! I went outside with a flashlight to see what was going on, only to find a … raccoon! He must have smelled the dead snake and was trying to get it out of the bushes to eat it. I guess they don’t call it the Wild Wild West for nothing. Of course this wouldn’t be summer in San Diego without wildfires. We had a few near and far from our home. 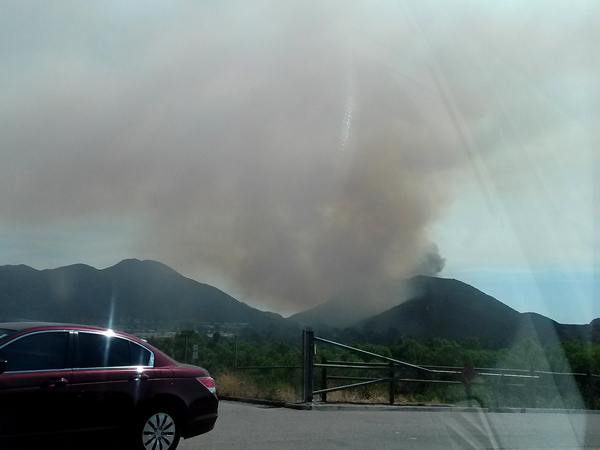 This one was only a few miles away but the wind was blowing smoke and ash in our direction. Never a good thing. Fortunately there was little wind and the wildfire was extinguished the same afternoon. We really have the best firefighters around. Finally, I’ll spare you the photo and I’ll just tell you I got… shingles! My lower back had been bothering me for a while, but since I often have nerve pain there, I didn’t really pay attention. That’s until I saw a red patch the size of a silver dollar on my lower back. At first I thought I had been bitten by a nasty spider, because it hurt just the same. Fortunately it didn’t get any bigger. After some online research I loaded up on vitamin B complex, lysine, and this amazing immune system boosting herbal supplement called Virattack. After a week of treatment, the pain was completely gone (the red spots are fading little by little). If you ever get shingles, give this a try before you go for the heavy-duty prescriptions. So this is a glimpse of our busy summer in pictures. A lot of fun and adventures, and never a dull moment. How was your summer? Note: the photo featured below is not for the squeamish. Don’t say I didn’t warn you. People who have spent any significant amount of time around me know I’m a klutz. They may not realize the extent of my klutziness until they witness examples of it, including spilling glasses, breaking dishes, bruising or injuring my body by hitting various non-moving objects… I’m one of those people who could walk around wrapped up in bubble wrap and still manage to get hurt. The only person I know who may be more of a klutz than I am is Sarah at Sarsm’s blog. And I really feel sorry for her. Unfortunately for the two of us, we’ve realized that the klutz gene is hereditary. There are a few genes I’m glad to have passed on to my kids, but this isn’t one of them. Give my kids 10 minutes of a playground and their shins will be covered with bruises. Like me, they walk into walls and door frames, they trip and fall, they slip in the stairs, they squeeze their fingers in tight places. Some people think I’m overprotective because I keep a close eye on my kids and always tell them to “slow down”, “get down”, “hold my hand”. But as their klutzy mom, I know they can use a little extra protection. And yet, they still get hurt. This past Friday was the latest example. As I was sitting on the couch with my 7-year old, I watch my 6-year old walk right into the pointy corner of our staircase railing as he tried to cut the corner to go upstairs. I heard that popping sound and knew it wasn’t good. I put pressure on his head while leading him in the kitchen, took a look at his bleeding head and put some paper towels on it as I applied pressure. We sat down on the couch while I calmed him down, telling him the blood would flow harder if he panicked and cried. After a few minutes I looked at the cut on his scalp and saw it was bleeding a lot less (nice platelets!) but I knew he would need some staples to close the gap. So I wrapped up his head tightly and we headed for the ER. I kept telling my boy he was very brave, because he really was. Once the initial pain disappeared and he realized he wasn’t bleeding to death, he was perfectly fine. He patiently waited for his staples while playing video games with his brother. 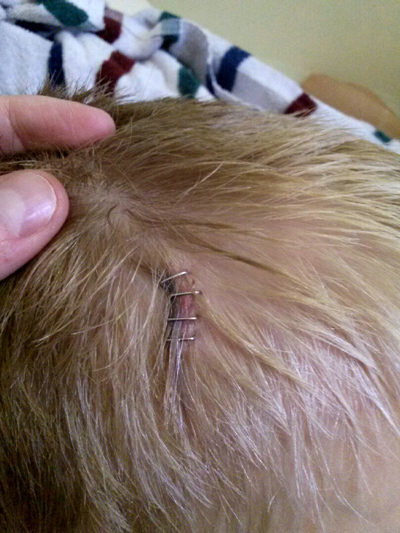 He didn’t complain even once when the doctor stapled his head. He’s a real trooper and I’m very proud of him. Here’s what his wound looks like after a couple of days. It’s healing very nicely. My boys know I have a scar on my scalp (a much bigger one, not as nice as this one) because I felt backwards on my head and split my scalp open when I was two. That was just the beginning of my lifetime klutziness. Since then my body has collected many scars and injuries, some of which my boys know of, others they don’t yet. When I was 6, I grabbed a large glass bottle of unrefrigerated soda during a heatwave and that bottle exploded in my hands. The shards of glass cut my face, my hands and my inner thigh, which still displays a 1″x2″ ugly scar today. I even had a piece of glass removed from my finger a year after the accident! When I was 8 or 9, I peeled a flap of skin off my knee after falling on a tree grate at school. I refused to have stitches and I have a nice ugly scar on my knee to prove it. I once ran into the pointy end of a door handle (not a doorknob) and I split the inside of my elbow open. More stitches. When I did horseback riding, I broke my elbow, broke my tailbone, and permanently damaged two lumbar discs, causing chronic back pain since then. As much as I love horseback riding, I would never encourage my kids to go for more than a mellow ride. I was in a car accident when I was 20 and got side whiplash, permanently eliminating the curvature of my neck, causing more chronic pain. I have twisted my ankles many times (but never broke any, yeah!). I twisted my knee so bad while running after the city bus once, it swelled up and I couldn’t bend my leg for several weeks. I damaged a vein on my shin by falling on the bottom of my car door frame one day. The vein never recovered and I had to have it shrunk eventually. I have bruised my legs so many times that I decided to keep all the protective bumpers I installed on the furniture when I had kids. I broke my new glasses and gave myself a black eye by opening my car door in my face. Most recently I deeply scraped my nose bridge by opening a kitchen cabinet door right into it. And that’s just for the injuries. I have many more scars on my body from surgery. When I was 7, I has a Meckel’s diverticulum burst (similar to an appendix) and I suffered peritonitis because I wasn’t taken to the hospital early enough. I had to have three feet of small intestines removed and I’m left with an ugly scar as a result. However I have beautiful scars from my fibroid removal surgery, and another beautiful scar from my two C-sections. I’ve realized scars look a lot nicer when the surgery is planned than when you have to fix some damage. I know I’m a hopeless case of klutziness and my kids are following right in my tracks. I feel sorry for them and the only thing I can do is to protect them the best I can, and tell them to “using walking feet”, “slow down”, “get down”, and “hold my hand”. They hate it but when something like this scalp injury happens, I remind them I’m just trying to keep them safe. Our motto at home is “safety first” but it’s really hard when the odds are against us from the start. Do you have any interesting stories of klutziness, stitches or staples to share?